The summer markets are in full swing and healthy, fresh produce is in abundance just in time for National Farmers Market Week to be celebrated August 3rd through August 9th, 2014. Thousands of farmers markets across the country offer consumers fresh, affordable, convenient, and healthful products sold directly from the farm. More and more farmers markets are offering electronic benefits transfer technology that can be used by recipients of USDA’s Supplemental Nutrition Assistance Program (SNAP) – as well as low-income women, infants, and children and seniors participating in the WIC and Senior Farmers’ Market Nutrition Programs – to get fresh, seasonal ingredients. Beets– so delicious and easy to prepare. Just boil until tender, peel the skins off and enjoy. This heart healthy vegetable is rich in fiber, vitamin C and potassium. Most growers will sell them with the greens still attached. Cut them off and use like you would any other leafy green. Tomatoes– a beautiful bounty of color awaits. They come in red, green, orange and yellow and in a variety of sizes and can be eaten raw, cooked and used in many dishes. Tomatoes are rich in many vitamins and minerals and high in fiber. Tomatoes have also been found to have mild anti-inflammatory properties. Green beans– delicious right off the plant or steamed. Rich in fiber and vitamins A, C & K.
Corn– get it while you can. August is peak corn season. Cook and eat right off the cob- a great summer treat! Carrots– this root vegetable is full of vitamins including: A, B, C & K. They also contain iron, potassium and are a good source of fiber. Eggplant– This beautiful, rich purple vegetable provides vitamins B & K and fiber. Basil-a wonderful herb to use fresh in many recipes. It adds great flavor and vitamins. Cilantro– great in many Mexican recipes, soups and salsa. Use fresh for the most health benefits. Rich in vitamins, minerals and fiber. Berries– Strawberries, Raspberries, Blackberries and Blueberries are all summer time fruits. Take advantage of the sweet flavors rich in vitamins, minerals and fiber. Peaches– rich in vitamins A & C, potassium and fiber. Delicious & juicy when eaten raw. Cherries– Raw cherries are high in fiber and vitamin C. Watch out for the pits. Choosing healthy options is easy when shopping local farm markets and stands. Fruits and vegetables harvested from the earth are naturally low in saturated fat, cholesterol and sodium. When eaten fresh, this produce is in its healthiest state and contains the most benefits for you. Be careful when preparing and cooking your produce, not to add sodium and oils that make it an unhealthy option. The goal of the USDAs ChooseMyPlate is to make half of your plate at meal times consist of fruits and vegetables. 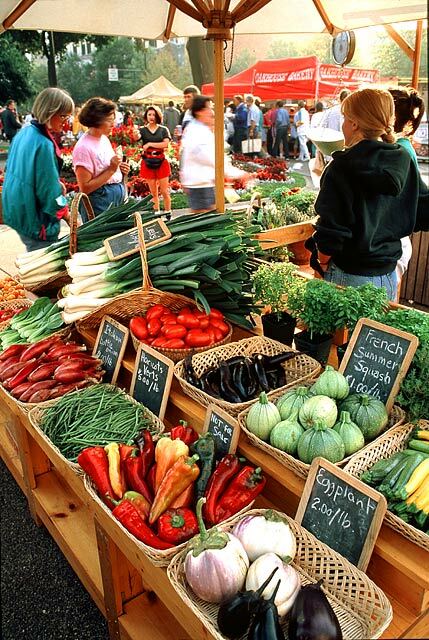 Shopping local farmer’s stands and markets is a great way to help make that happen. Get healthy and help your local farmer at the same time. Be certain to bring a bag along, after strolling the rows of beautiful, farm fresh produce in the sweet summer air, you will need one! Deliciously refreshing, pink and light, this smoothie tastes light and delicious!